Anon c1519: Processional: Sancte Dei pretiose; Ludford: Missa Lapidaverunt Stephanum (Gloria & Agnus Dei), Lady Mass Cycle (Agnus Dei, Alleluia – Salve Virgo, Gloria, Kyrie, Laetabundus); Cornysh Magnificat; Sheppard Hymn: Sancte Dei pretiose; Anon c1530: Offertory: Felix namque. 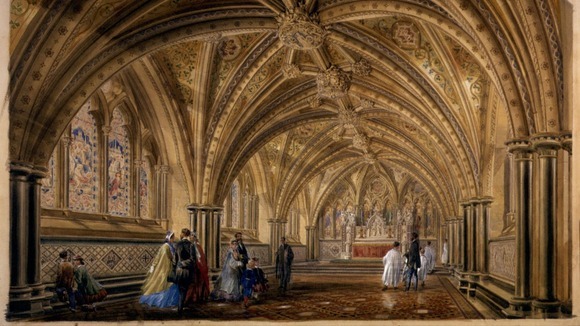 Anybody who has visited the Houses of Parliament in Westminster will probably have entered by the St Stephen’s entrance and walked through St Stephen’s Hall towards the famous ‘Lobby’, all built around 1850 to the design of Charles Barry. Most will not realise the significance of the St Stephen’s name, or what lies hidden beneath their feet. St Stephen’s Hall is the site of the mediaeval Royal Chapel of St Stephen’s, originally a private chapel for the King and his family and only accessible from the Royal Palace of Westminster. Barry’s sumptuous ceremonial hall was built on top of the surviving undercroft of the Royal Chapel, now known as St Mary Undercroft. The chapel was first mentioned in 1184, and was rebuilt by Edward I around 1292, a project that lasted many years. It was raised to the status of a college by Edward III in 1348, and developed an outstanding tradition of music which lasted until the dissolution in 1548 when it became the first meeting place of the English House of Commons, until 1854. Many of the current parliamentary traditions stem from these years of being housed in a chapel, for example the collegiate-style opposing seats separated by a central aisle, and the custom of bowing to the Speaker who used to sit on the altar steps, the latter probably being what was being bowed to. This recording explores aspects of the musical life of the chapel in the period leading up to its demise in the closing years of Henry VIII’s reign, with a focus on the music of Nicholas Ludford, organist of the chapel. Another important aspect is a detailed look at the role of the organ in liturgical music of the period. This is aided by the use of Goetze & Gwynn’s 2010 reconstruction of a late mediaeval organ, the third in a series of instruments based on fragments of two such organs found in East Anglia (pictured: details here). 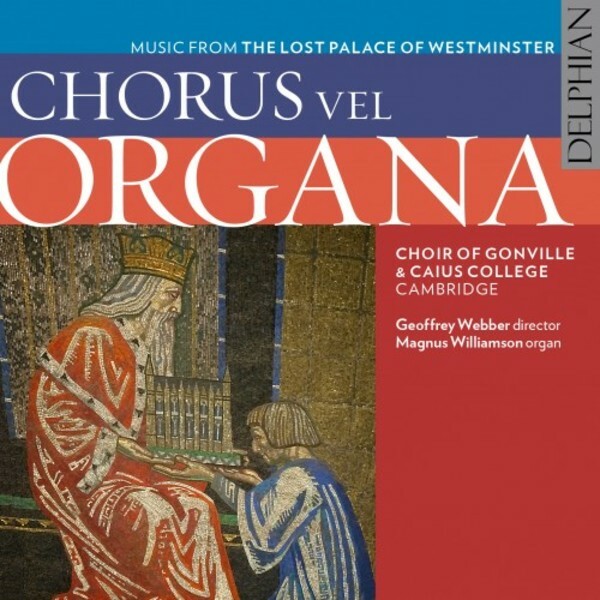 Having been involved in a similar project some years ago, when recording the complete organ works of Tallis (details here and here), I know the difficulties of combining the large, but fragmented, collection of liturgical organ pieces with the relevant vocal music. My solution was to add anonymous verses to Tallis’s own versions to make up the required number, together with occasional sung faburdon verses. A few such anonymous organ verses are used here, but many have been devised by Magnus Williamson in a very effective period manner. He responds well to the often quirky style of the originals (by the likes of Redford and Preston), one example of the latter being the extraordinary anonymous Felix Namque offertory (track 3), dating from around 1530, with its curious range of rhythmic complexities, including setting two, four and eight beats against three which Magnus Williamson, quite correctly, does with mathematical accuracy. One of the historic treasures of Gonville & Caius College is the Caius Choirbook (pictured), containing music performed in the lower undercroft of St Stephen’s Chapel by Ludford and Fayrfax, who may have presented it to Cambridge University as his doctorial exercise in 1504. The CD includes music from that manuscript. The choir also had the opportunity to perform some of this music in St Mary Undercroft (pictured) itself as part of the Virtual St Stephen’s project (details here). Extracts from that performance can be viewed here. The singing of the student choir is excellent, with a confident and strong tone in consort and with some fine solo moments from individuals. My only quibble is some rather excessive vibrato from one of the soprano/treble voices, most notably in the very exposed duet passages in the Laetabundus sequence, but also audible in several of the full choir sections. It always amazes me how Oxbridge collegiate musical directors like Geoffrey Webber manage to mould the student choirs into such superbly professional units, given that their age is usually between 18 and 21, and that around one-third of them will change every academic year. There are many such mixed-gender student choirs (as opposed to the all male/boy treble choirs of the choral foundations), and Gonville & Caius is amongst the finest – and the most innovative in their choice of programmes and musical projects. The programme notes give important information about the project and the role of the organ in the music of the period. But even if you have no direct interest in that aspect of the project, or of the history of the Parliament buildings, this is a glorious insight into one of England’s musical highlights.